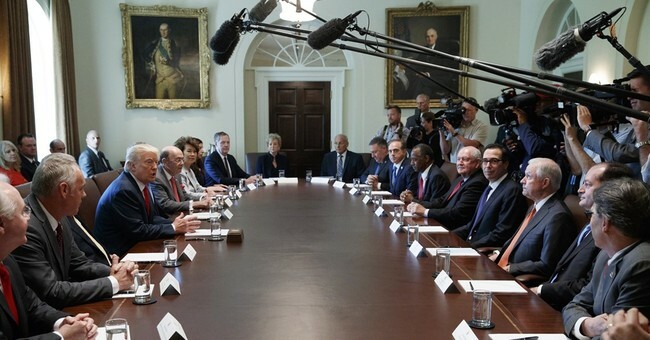 Several of President Trump’s Cabinet members participate in a weekly Bible study, the Christian Broadcasting Network reports—something that hasn’t been done in at least 100 years. The Bible study is led by former NBA player Ralph Drollinger, who founded Capitol Ministries with the lofty goal of changing the hearts of lawmakers so they in turn make good policy decisions based on their Christian worldview. In addition to the dozens of Bible studies he has started around the U.S. and worldwide, Drollinger teaches weekly sessions in the House and Senate, as well as leading roughly a dozen of Trump’s Cabinet members. Health Secretary Tom Price, Energy Secretary Rick Perry, Education Secretary Betsy DeVos, Agriculture Secretary Sunny Perdue, and CIA Director Mike Pompeo are among some of those who attend. Vice President Mike Pence and Attorney General Jeff Sessions also come to the Bible studies when their schedules allow. And President Trump receives a copy of what’s taught at the sessions each week. "It's the best Bible study that I've ever taught in my life," Drollinger told CBN about the Cabinet members. "They are so teachable; they're so noble; they're so learned." Drollinger believes it’s the first time there’s been a formal Bible study held among top Cabinet members in at least 100 years. "I don't think Donald Trump has figured out that he chained himself to the Apostle Paul," Drollinger jokingly told CBN.